At the Connection Settings step of the wizard, provide the connection settings for the selected database. 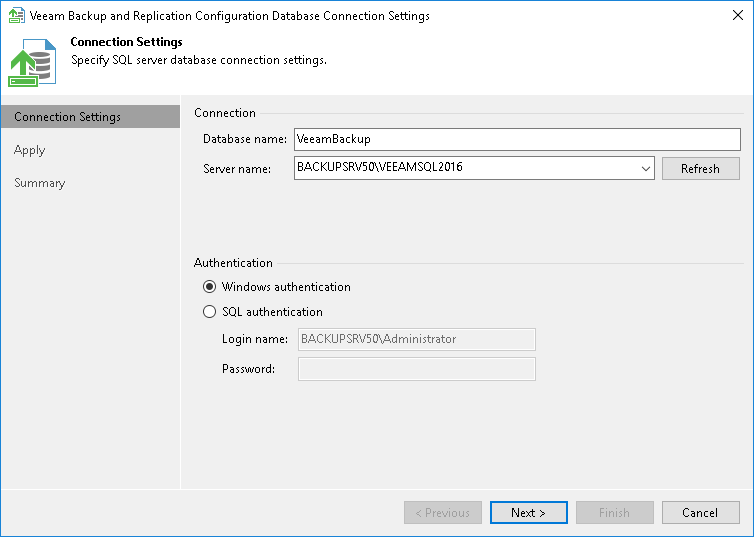 Specify the Microsoft SQL Server\instance and database name to which you want the Veeam Backup & Replication installation to connect. Both local and remote Microsoft SQL server instances are supported. Microsoft SQL server instances available on the network are shown in the Server name list. If necessary, click Refresh to get the latest information. If a database with the specified name does not exist on the selected Microsoft SQL Server (instance), it will be created anew. If you plan to use the Microsoft Windows authentication, consider that the current service account will be used (that is, the account under which the Veeam Backup Service is running). If you plan to use the Microsoft SQL authentication, provide a login name and password. To view the entered password, click and hold the eye icon on the right of the Password field.